Also known as "the Chanel collection that features the newest and most waited-for Chanel nail varnish on this side of 2013, Taboo", for all of those who have been asking me, the latest Chanel collection reveals the multiple facets of the Lèvres Scintellantes gloss. Today, people! Le Vernis in 583/ Taboo, a new shade, will be €22.50. 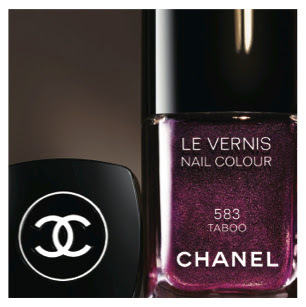 Chanel are continuing their year-long nod to plum/burgundy shades for nails with a new shade called Taboo - a "shimmering violet plum that reveals bluish red tones at its heart". A plum shade that, f from all the swatches I've seen of it online, features a fantastic galaxy of blue and red sparkles. I cannot wait. I cannot wait, I cannot wait. W.A.N.T. Yum.